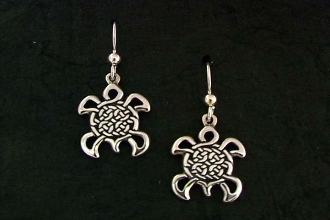 These are the smallest of the turtle earrings, but still of a medium range at around 1/2" tall, and of a solid weight and presence. Turtles have a prominent role in many creation mythologies worldwide. They are associated with life, the living planet, and the cycles of living beings and longevity. The knotwork element of the design, is a modification of the traditional "circle of Life" pattern from celtic manuscript origins. The union of these two symbols of life is an artistic expression born of a love of turtles and celtic style knotwork to create new tailsmans of life in a changing world.